For some, making a cake can be challenging because they never baked before, or think making a cake is difficult. I encourage you to try it and maybe start with a box mix (though I am not a fan it is nice for someone who just starts). The next step after a simple cake is a) a more difficult cake (lets say with layers) or a themed cake for a specific party. It can be scary at times because it seems so complicated. Melissa from “The Party Works” was so kind to write a little post about how a themed cake can be very simple. – Set the oven to 350 degrees and grease one 9-inch square pan and one 9-inch round pan. – Heat the cocoa powder and evaporated milk on the stove in a saucepan on medium heat, stirring occasionally until the cocoa is completely dissolved. Remove the saucepan from the heat. – Combine the dry ingredients in a large bowl and then add the wet ingredients, including the cocoa mixture you made on the stove. Use an electric mixer to mix all of the ingredients together. – Pour the cake batter into the 9-inch square pan and the 9-inch round pan. Pop the pans in the oven and let the cake bake for 40-45 minutes. – Take the cake pans out of the oven and let the cake cool. – Remove the cake portions from the pans, and cut the round cake portion in half. – Lay the square cake portion down with one of its points facing up, so that it looks like a diamond instead of a square. Lay the round cake halves against the top sides of the square cake portion so that all the pieces form a heart shape. Assess the top surface of the cake to make sure that it is level. If it isn’t, use a cake leveler to even things out. – Ice the heart shaped cake with the icing of your choice and be sure to fill and cover up the breaks between the cake pieces, so they’re not visible. – Decorate the cake with icing and edible cake decorations. For instance, you may want to draw pink, red, and white flowers on the cake with icing. – Enjoy a romantic evening with your love theme cake! 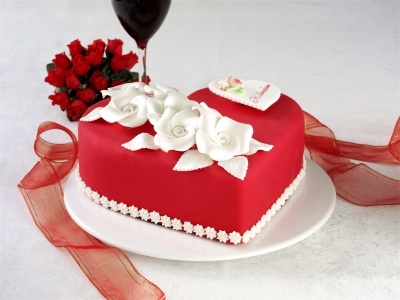 A heart-shaped cake is one of the simplest kinds of themed cakes you can make. It will require some extra effort to make a themed cake in the shape of a T. Rex for a child’s birthday. However, you’ll have to follow many of the same steps, no matter what kind of themed cake you make. For more complicated cake shapes, you may need to use an x-acto knife to be able to cut cake pieces efficiently, and you may also need to draw the cake shape you want with pencil on wax paper, place the wax paper on top of the cake, and use what you’ve drawn as your guide while cutting the cake. The possibilities are endless when it comes to the kinds of themed cakes you can make. So, feel free to try the heart-shaped chocolate cake recipe above or get creative! Author’s Bio: Melissa is an event planner and guest writer who writes for a number of online blogs about parenting, event planning, baking, and where to find Super Mario Bros party supplies. Posted in Cake and tagged baking, cake, chocolate, easy, heart shaped, recipe. Bookmark the permalink.